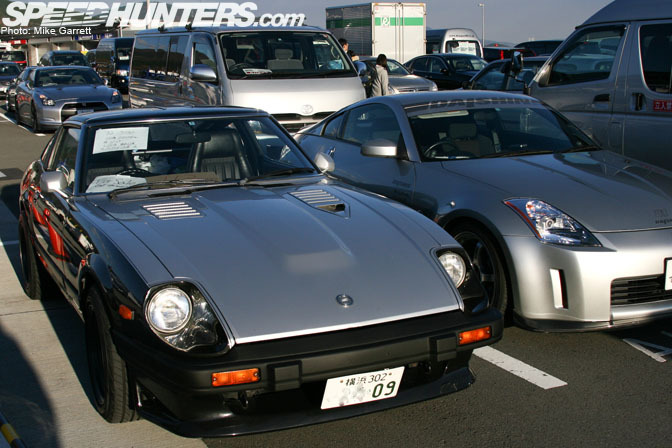 Right now might be the off-season as far as most automotive activity goes, but here in Japan things couldn’t be busier. Tomorrow I’ll be heading out to Yokohama to have a look at the much-anticipated Mooneyes Hot Rod and Custom Car Show, and right after that it’ll be time to prepare for Wednesday’s big Rev Speed time attack at Tsukuba Circuit. 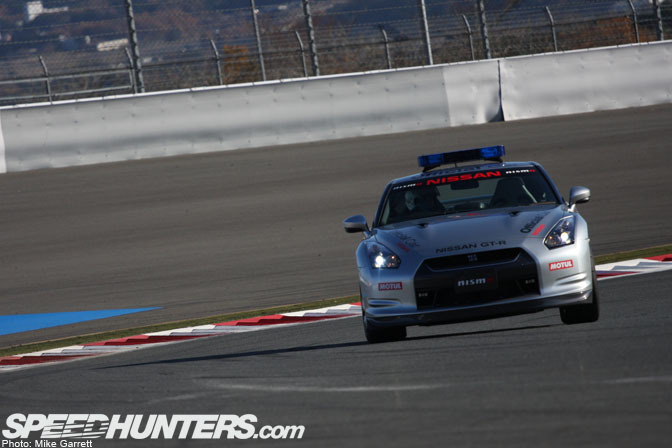 Before we move on to the stuff though, I have a few more photos I wanted to share from last weekend’s Nismo Festival. Someone commented that they wanted to see more Group A shots, so here’s a photo of the Calsonic R32 sitting in the garage during the morning warm-up session. The pits were a center of activity all morning with the different race cars flying in and out of the garages. It was awesome to see, but us photographers certainly had to be alert for moving race cars. There’s always something cool about test versions of race cars like this Super GT Z that was running during the morning warm up session. 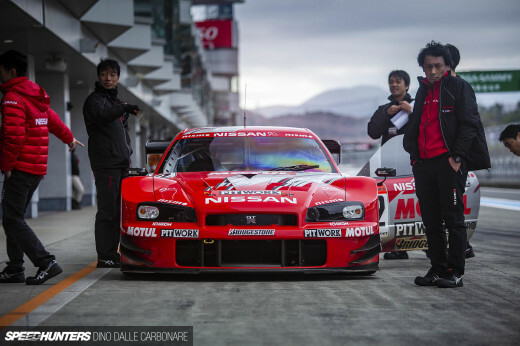 You might remember that last year’s Nismo Festival was where the R35 GT500 test car debuted. This year’s event didn’t have anything quite so groundbreaking. If there was more time to explore, I’m sure I could have had several posts JUST about the interesting cars found in the parking lots. I did spot this S130 Fairlady Z with a for sale sign in the window. The car was in original condition right down to the factory two-tone paint job. 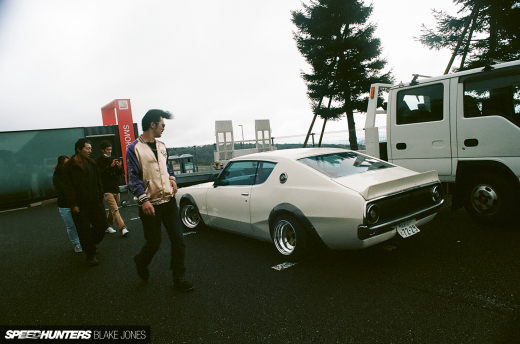 The S30’s are great, but I also love a properly done S130 like this one. The only aftermarket parts on the exterior were the RS Watanabe wheels. Here’s a shot of the BTCC Primera as requested. Regrettably, this car wasn’t really “raced” at the event, it was mostly there for the celebration of Nissan’s international racing ventures over the years. Someone asked if I had any Super Silhouette shots, but sadly Nismo didn’t bring those cars out this year. They have tons of historic cars in their collection, but not enough time or pit spaces to bring all of them out at once. A view of the legendary S20 engine under the bonnet of one of the KPGC10 Skyine race cars. 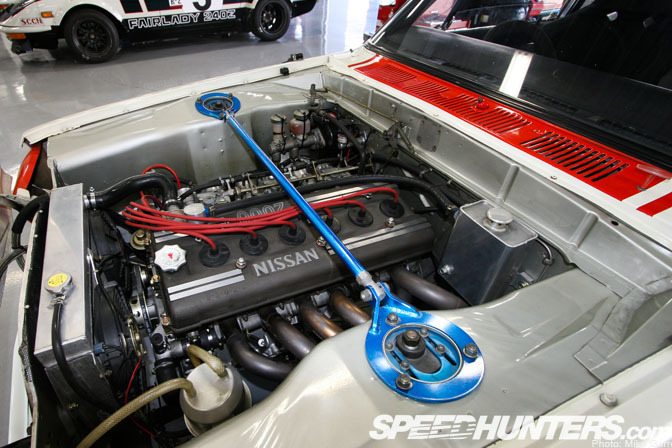 The cleanliness of the engine compartment shows just how meticulously these vintage race cars are maintained by Nismo. Here’s the M-Speed R34 on display at the Ray’s Engineering booth in the paddock. 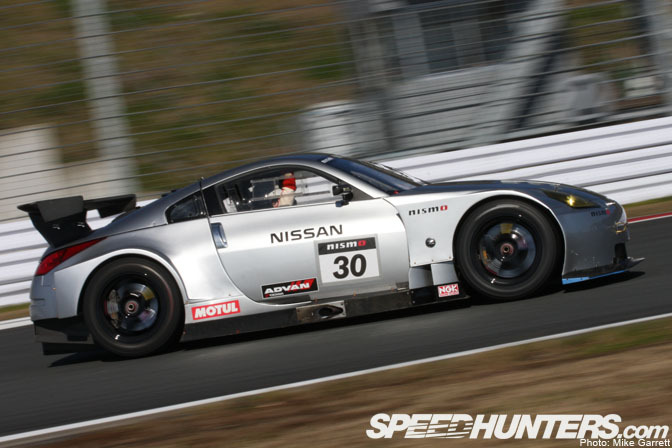 I was thinking about how exciting it’d be to see this thing out on the track running with the Super GT cars. I guess well have to wait until Wednesday to see this monster in action at the Rev Speed event. Some more Group A action with Masahiro Hasemi in the 1993 UNISIA JECS Skyline. 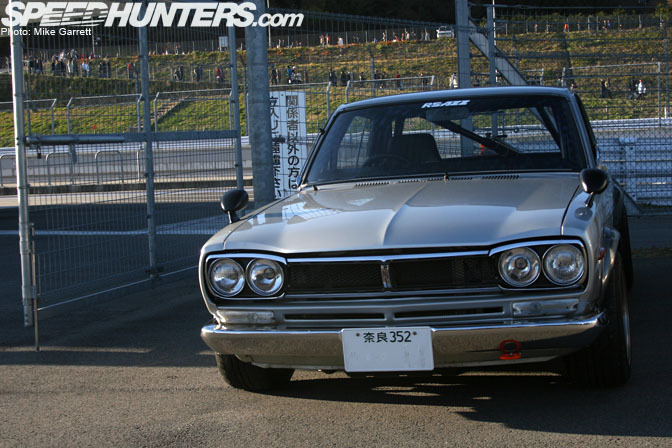 This Hakosuka Skyline street car was found tucked away in the paddock. You can tell that this car sees a lot of track use just by looking at the bucket seat, roll cage, and tow hook on the front. 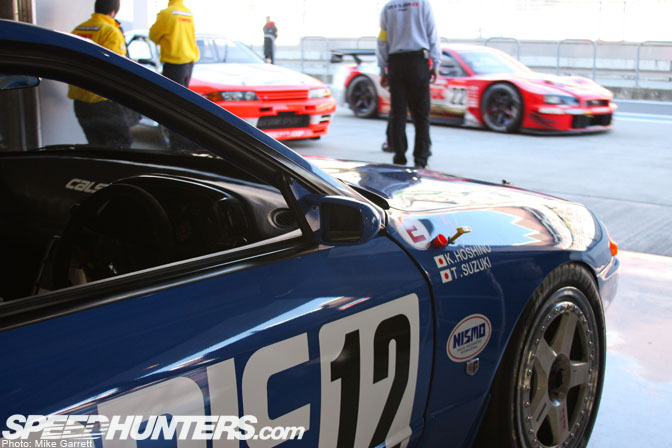 In fact, I think I remember seeing this car running at the JCCA Tsukuba event back in July. 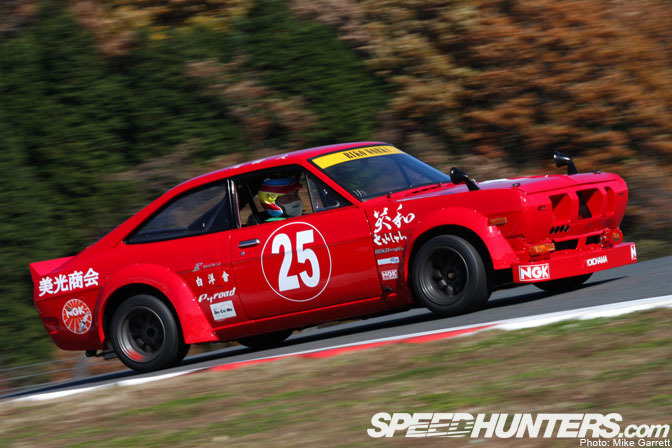 Chiba Prefecture’s Biko Works is known for building and selling street-tuned classics like Hakosukas and Z’s, but they also have this B110 Sunny race car that competes in numerous vintage race events around Japan. The cool-looking nose piece and front spoiler on this car are period correct TS parts. Another view of the 2008 GT500 championship winning Nismo Xanavi GT-R driven by Satoshi Motoyama and Benoit Treluyer. This is the same car featured in the film that Rod just posted. Visually, my favorite part of these cars has to be the way the exhaust dumps out just behind the front wheels. One of the impressive GT machines ever, just as Rod said. At the end of the day, all the race cars gathered for a parade lap before parking in front of the main grandstand for the grand finale. 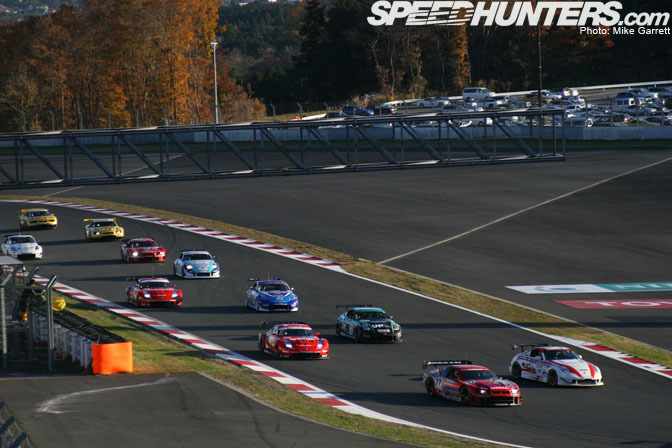 The dozens of Nissan race machines parading around the course in the fading afternoon sun made for a very memorable scene. And in closing, here’s a shot I took from the car while waiting in traffic after the event. It took over an hour and a half to travel the 10km or so from the track to the Tomei Expressway interchange. At least there were plenty of cool cars to see along the way. 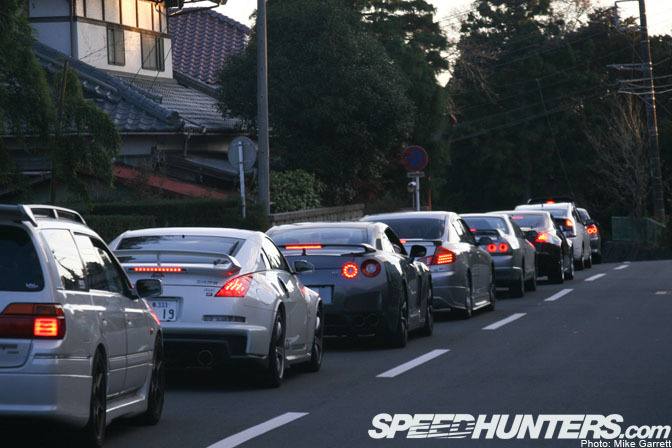 As the photo shows, the road is packed full of Nissans as far as you see (except for that pesky Prius up there in the front!). It was an appropriate end to a day packed full of Nissan madness. Well, that does it for my Nismo Festival coverage. Expect some nice high res wallpapers from this event soon. I envy the experiences you guys get to take part in on your coverage in this Nissan month. 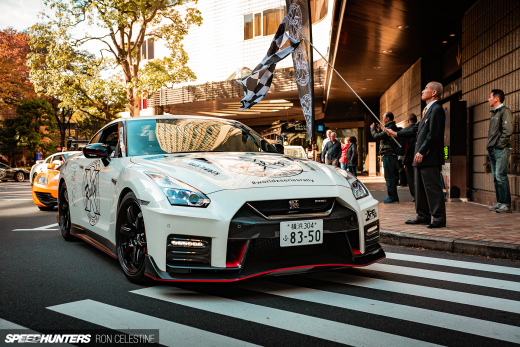 I am stuck here in the middle of the U.S.A. dreaming of Japan tuning cars here, but i've always wanted to go there to get more inspiration for ideas, and reading things like this make it alot easier for me to see whats going on in recent times. Thanks for the great coverage of an event many of us wish we could attend but probably never will. Great photos and coverage as usual! haha yeah is that a prius i see in the last photo? is it stagea at back of the last photo??? Indeed that is a Nissan Stagea ibnusald. Seres one (WC34) I believe as the tail lights are amber/red rather then Clear/red. you guys should make a background of the second pic with the #30 350z racecar. awesome car. Awsome post, this last weakend i have been at Oran Park (i live in Australia) at the V8 Supercars event. 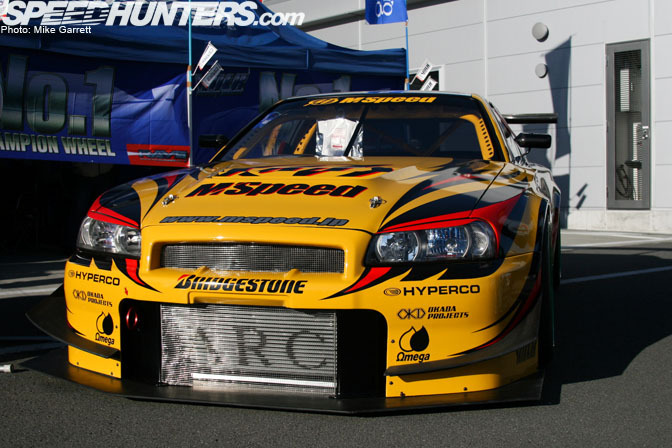 One of the support categories was the group A and C cars from Australian touring car chamionships of the past. One R32 was running and it was just slaughtering everything on the track. Such an awsome car! No more B310 .. but the B110 is worth it.. love that nose cone..
^^ as said above, need more b chassic pics. Would love a wallpaper of a B110 TS/MT cup cars.